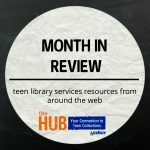 The Hub has always been a collection development resource, highlighting books and other materials and helping librarians and library workers connect the teens they serve with resources that meet their needs and support their interests. We cover everything from podcasts and YouTube videos to manga, anime, and of course, books! But we’ve never really done straight reviews of titles. Likewise, the Selected Lists are great tools for collection development, but in today’s world, many library users expect to have access to materials as soon as they’re released, so waiting for the publication of a final list after the year’s already done and librarians and library workers have spent their budgets and are now looking at next year’s releases isn’t as practical as it once was. Additionally, Selected List Committees have always deliberated and discussed the merits of various titles, but there wasn’t a mechanism for sharing those perspectives with librarians and library workers beyond the final list with very brief annotations. Now, the public will have access to some of the behind the scenes action! The system will be more transparent. Blog posts that feature nominated titles will provide more detail and context to why the YALSA members vetting these titles feel that it is a strong contender and how it fulfills the list’s criteria. Discussion of each book will emphasis its suitability for lists, but also discuss the appeal factors for each book. This information can help librarians and library workers not only decide if it’s right for their library’s collection, but will also help librarians and library workers match books to readers. More than just collection development recommendations, the discussion of nominations on The Hub will serve as a more in depth readers’ advisory tool. Does this sound like something you’d be interested in being a part of? Do you love not only discussing books with colleagues, but listening to audiobooks or thinking about what books can best reach reluctant readers? Would you like to grow as a reader and a writer while networking with other professionals? This is the YALSA volunteer opportunity for you! Ready to submit your volunteer form? Do it here! Have questions or want to talk about it? Feel free to reach out to me at yalsahub@gmail.com. Next Post Announcing the 2017 Hub Reading Challenge!